May in Montclair, a month-long calendar of events welcoming Spring to our fair town, is drawing to a close. Traditionally begun with school children dancing around the May Pole in centrally-located Watchung Plaza, the programing is centered around cultural and recreational events with a civic bent. There were used book sales to benefit Lacordaire Academy, walking tours all over town to heighten awareness of our Historical Society — hurting for funds in the economic downturn — and Mothers’ Day tea under the wisteria, which bloomed early this year, at the Van Vleck House and Gardens. One of the crown jewels of our May in Montclair is most certainly the blooming of the irises at the Presby Memorial Iris Gardens in Upper Montclair. Originally conceived by Frank H. Presby, who was a director of a local bank, a founding member of the Montclair Art Museum and instrumental in founding our parks, he was also a devotee of the iris. A founding member of the American Iris Society and its first treasurer, he wished to bestow upon Montclair’s newly-acquired Mountainside Park a garden of irises from his own collection. Unfortunately, he died before his wish was realized, but the Citizens Committee of Montclair, appointed by the mayor, saw Presby’s dream to fruition in 1926. Today, the legacy blooms bright, a Rainbow on the Hill representing different things to different people. An iconic image of our town, the irises themselves are varied as our citizens: heirloom varieties from the 16th century, to Presby’s own hybridized species named for his wife and daughter, to medal winners of today. best describing the unscrupulous bombing of urban, residential targets in the United Kingdom. According to The New York Times, the wife of the Mayor of Barnet, Helen Barrett Speers, “headed a committee to evacuate English children to Montclair,” part of a nation-wide effort to protect its children literally placed squarely in the line of fire. The London Borough of Finchley might ring a bell to readers as the setting for the 2005 movie version of CS Lewis’s The Lion, The Witch and The Wardrobe, from where the four main characters of the book, children much like the 52 who lived in Montclair in 1941, are evacuated to the more safe countryside manor of Professor Digory Kirke during World War II. Although there is no mention of Finchley in the original novel, the opening plot line of the book is very squarely centered on the terror and resulting upheavel of the Blitz, a bombing campaign often strategically aiming for Finchley and Barnet Boroughs, an area rich in tube stops, train stations and telecommunication centers. On the BBC website, an oral history by Thomas Burt records just how horrific and dangerous Finchley was, creating a stark reality and understanding in the present-day mind of the need to evacuate the most vulnerable of London’s citizens. The pleasant bi-product of this arrangement is the 71 year-long meaningful friendship that blossomed like the iris after the war. Annually, school children from both countries visit our respective communities, most notably through the Civics and Government Institute at Montclair High School. There is also an active Friends of Barnet group and corresponding Friends of Montclair in our twin communities which offer host homes for annual visits, and programming to entertain and enlighten guests and friends with long-standing appeal. The relationship is anything but fair-weathered. 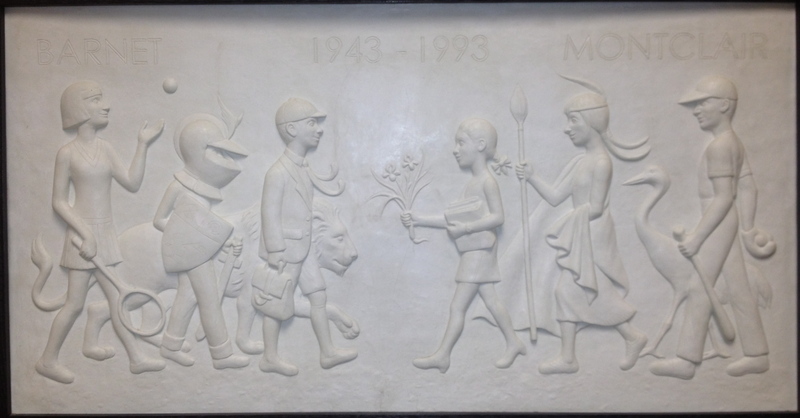 This cemented friendship is lovingly re-created in a bas relief sculpted by Meredith Bergmann, which is subtly displayed on the second floor of our municipal building on Claremont Avenue. On it a lion reminiscent of the protective and Christ-like Aslan, the lion who is a central character of CS Lewis’s The Lion The Witch and The Wardrobe, is a companion to a group of children meeting another, conversely escorted by a crane. The crane represents our town of Montclair, formerly known as Cranetown after our founding resident Azariah Crane who came here in 1694 to create the town that would one day protect its European brethren. The iris is another symbol of protection at the Presby Gardens, as a tangible reminder of the Beauty of life for a distressed and recovering war veteran . The Presby offers a cell phone audio tour of the gardens, and Stop Six tells the tale of the WW II soldier who was seen daily in the gardens in the aftermath of the war. The curiosity of the volunteers situated at the information table was peaked when this upstanding, handsome, quiet man strolled the blooming wonderland along the dry creek bed, inspecting the blooms and then silently taking in the entire rainbow of color. After an entire week of silent appreciation, the soldier finally came forward to those volunteers and with stoicism declared that this breathtaking display of natural beauty quite literally saved his life: that an existence so decorated was certainly worth living. The rhizomes of some of those life-saving irises now beautify Friary Park in London, where one modern apartment house is named The Montclair, and prewar structures are dotted with other more modern ones built to replace those decimated during the Blitz. Cared for by those 52 children who graced the suburban streets of Montclair in 1941, the iris and the friendship are cultivated in kind. Is there an opening at the Montclair Times or somewhere for ‘incredibly eloquent town historian’?? Your love for our town shines through in these gems from its past! Great post title too. Thanks Lisa! This is one of my favorite stories uncovered thus far. I have lots of oars in the water over this topic and hope to hear more about those children that lived here for 3 years during the War, and about the garden in Friary Park, London. It’s an ancient place with lots of history in its own rite. This is the seed of something larger, I hope! If you look closely at the relief there are other details worth mentioning: the Barnet child dressed as a knight, and the Montclair child dressed as a native American. One holding a baseball bat, the English child, a tennis racket. Charming piece!